The wineberries have ripened all over our mountain, and the boys picked a big batch for me this weekend. 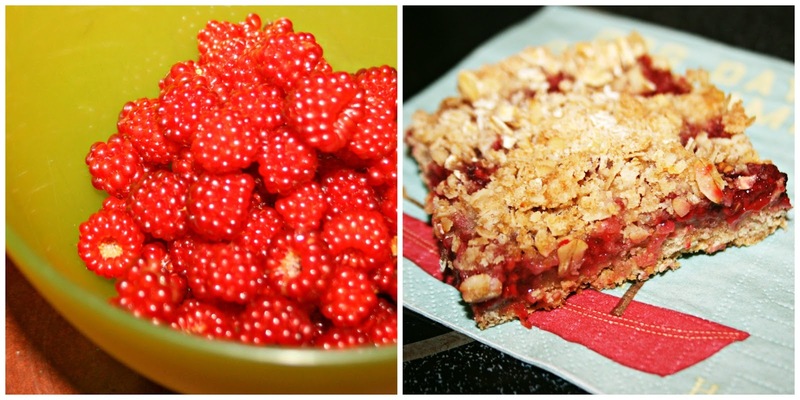 I decided to make wineberry breakfast bars. In addition to being a tasty breakfast bar, they make a light and tangy dessert. Preheat oven to 375*. Spray a 9 x 13 inch pan with nonstick cooking spray. Put flour, 3/4 cup brown sugar, salt and sugar in a food processor. Pulse a couple of times to combine, add butter and pulse until coarse crumbs form. Add oats and pulse 2-3 times more to mix. Remove 1 1/2 cups mixture and set aside. Add orange juice to remaining mixture and pulse until just moistened. Press mixture firmly into bottom of the pan. Whisk together flour, sugar and salt in a large bowl. Fold in berries and lemon juice. Spread on top of crust. Sprinkle reserved crumb mixture over the filling. Bake 35-40 minutes. Allow to cool 2 hours and then cut into bars. Store in the fridge. Readers, what is your favorite berry, and what kind of dessert do you like to make from it? These look delicious! I would love to have taste tested one. Sounds great !!! Have a wonderful start to your week ! I bet mulberries would be good in this recipe as well. Your bars look yummy, Lisa. I have never had a wineberry before. I like to make Blueberry Icecream. Have never heard of wineberries, but they look so good. I love blackberries and raspberries or just about any kind really. Happy Monday! We love blackberries, but Hubby eats them before we can make anything with them. LOL Your bars look really good! Seriously? WINEBERRIES ARE A THING, TOO??? I had no idea. I've never heard of wine berries! My favorite is black raspberries. I recently tried baking granola bars. They turned out really chewy since I didn't realize my oven wasn't working. Those look really good! I don't think I've ever had wineberries. They look so pretty and red. I love blueberries and blackberries and strawberries. Larry's cousin gave us some blueberries from their bushes. Larry smashed his up with sugar, then ate them over ice cream. I just eat mine plain or on ice cream. I really should have made some muffins. Second - i got to look up "wineberry" - because i didn't know what it was . . Suddenly, I'm hungry. And it's not just because we're getting close to lunch time. I never heard of them! Are they named this because they make good wine? Your pictures are DIVINE! These look delicious and healthy. I might try the recipe with our blackberries. I have never had wineberries! They look similar to raspberries. Do they taste like them too? These look great! Wineberries are new to me. I will have to look them up. My favorite summer dessert any berry cobbler. Do cherries count? I love cherry pie. Haven't been here forever and this evening my hubby is gone and the house is quiet.. NO TV... I read a lot of your blogs and really miss seeing and hearing about what you are doing.. The red flower is an asiaic lily.. I love the hands on science farm you took the boys too.. that looked like lots of fun.. Your boys are growing up so fast..
My fav. berry is STRAWBERRIES--but I also love Blackberries. I love blackberries and raspberries! This looks really good! This is the first time I've heard of wine berries. They look good...like the blackberries that grow here only they're red. Neat! Yum!!! We may have them around here and I just thought they were black berries that weren't ripe yet. Those look so yummy! Thanks for the recipe.